We are very pleased to announce the 6th Annual Hobart St. Back-to-School Community Festival which is traditionally held every year on the 3rd Sunday in August. Due to extenuating circumstances, this year the event has been moved to the rain of date: August 26th from 2:00pm to 7:00pm on Hobart Street between Elm Street & Whalley Avenue. For the past 5 years we have provided school supplies to the youth of all ages in this neighborhood and surrounding communities. Many of our participants come from different social and economic backgrounds, and are faced with many financial restraints. In our efforts to alleviate some of the burden, we provide donated school supplies to the youth for the upcoming school year. Last year in 2011, we were able to distribute over 100 bags of assorted school supplies to youth with ages ranging from Kindergarten through College. The remaining supplies were donated to a local non-profit agency, The New Haven Family Alliance. Our goal for 2012 is to expand our services by providing school supplies to at least 200 children within the neighborhood and surrounding communities. We will also focus on promoting educational programs within the community, such as WEB (Westville, Edgewood and Beaver Hill) Saturday reading program, and the Homework after school program. In addition, we will promote financial literacy, educational advancement, and health awareness to the members of this community with the help of local community leaders, institutions and business. Read about it in the New Haven Register! We are accepting donations whether monetary, stationary supplies, (i.e. pencils, book bags, calculators, etc. ), or any form you deem feasible. Our event is something that many of the youth and adults look forward to attending each year, and we look forward to planning many more. We need your support for the success of this year’s annual event and would like to thank you advance for your contribution. If you would like to mail in a donation, please make payments payable to Shayla Streater, 43 Quinnipiac Ave. New Haven, CT 06513. 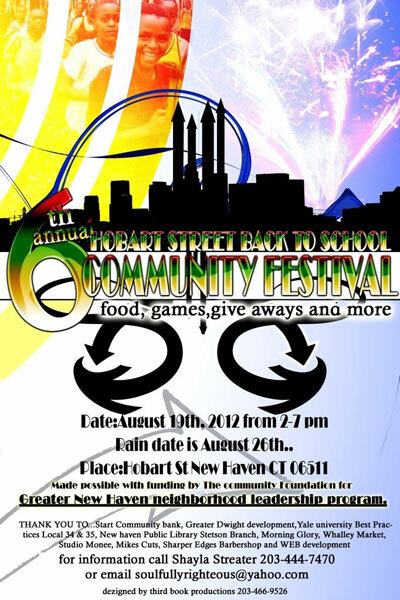 All payments will be processed through a special account donated by Start Community Bank specifically for this event. Made possible with funding by The Community Foundation for Greater New Haven neighborhood leadership program.